Jan. 6. Twelfth Night Party. Bossier Civic Center, Bossier City. Jan. 11. Krewe de les Femmes Mystique Grand Ball. Diamond Jacks Casino, Bossier City. Jan. 18. Krewe of Sobek.Queensborough, Shreveport. Jan. 20. Krewe of Harambee MLK Day Mardi Gras Parade. Downtown, Shreveport. Jan. 25. Springhill Krewe of Artemis Grand Ball. Civic Center, Springhill. Feb. 7. Krewe des Ambassadeurs Bal. Diamond Jack’s Ballroom, Bossier City. Feb. 8. Springhill Main St reet Mardi Gras parade . Downtown, Springhill. Feb. 8. Springhill Main Street Mardi Gras block party . Krewe of Artemis Den, Springhill. Feb. 15. Gemini XXV Grand B al. Shreveport Convention Cen ter, Shreveport. Feb. 15. Minden Fasching “Mardi Gras” Karneval & Parade. Minden. Feb. 15. Krewe des Ambassadeurs. Bossier City. Feb. 15. Krewe of Janus parade. Monroe. Feb. 21. Krewe of Centaur Fload-Loading Party. Shreveport. Feb. 22. Krewe of Centaur. Downtown to Broadmoor, Shreveport. Feb. 22. Krewe of Allegro Ball. Ruston Civic Center, Ruston. Feb. 23. Krewe of Barkus and Meoux Pet Parade. Downtown, Shreveport. Feb. 28. Krewe of Gemini Float-Loading Party. Krewe of Gemini Mardi Gras Museum, Bossier City. March 1. Krewe of Dionysos. Shreveport. March 1. Gemini XXV Grand Parade. Shreveport. March 2. Krewe of Highland Parade. Historic Highland Neighborhood, Shreveport. March 4. Krewe of Aesclepius Children’s Parade. Bossier City. Jan. 6 Twelfth Night Celebration. Lake Charles Civic Center, Lake Charles. Jan. 10 Community Dance. Lake Charles Civic Center, Lake Charles. Jan. 11 Queens’ Pageant. Lake Charles Civic Center, Lake Charles. Feb. 15. Krewe of Ambrosia Mardi Gras Mambo. Thibodaux. Feb. 15. Krewe of Hercules Tableaux and Ball . Houma-Terrebonne Civic Center, Houma. Feb. 15. Krewe Des T-Cajun . Larose. Feb. 16. Krewe of Versailles . Larose. Feb. 1 6. Krewe of Shaka. Thib odaux. Feb. 16. Krewe of Des Petites. Golden Meadow. Feb. 21. Krewe of Hercules . Westside Route. Houma. Feb. 22. Krewe of Petit . Caillou, Chauvin. Feb. 22. Krewe of Aquarius . Westside Route, Houma. Feb. 22. Krewe of Ambrosia parade . Thibodaux. Feb. 22. Krewe of Hyacinthians Tableaux and Ball . Houma-Terrebonne Civic Center, Houma. Feb . 22. Annual Mardi Gras Run. G ueydan. Feb. 22. Vinton Mardi Gras Celebration. Downtown, Vinton. Feb. 23. Krewe of Hyacinthians . Westside Route, Houma. Feb. 23. Kr e we of Titan s. Westside Route, Houma. Feb. 24. Krewe of the Golden Years parade and ball. Feb. 28. Merchants’ Parade. Downtown, Lake Charles. Feb. 28. Krewe of Aphrodite. Westside Route, Houma. Feb. 28. Krewe of Adonis. Morgan City. Feb. 28. Krewe of Triton. Lafayette. Feb. 28. Krewe of Athena. Golden Meadow. March 1. Krewe of Dionysus . Berwick. March 1. Krewe of Apollo . Lockport. March 1. Krewe of Atlanti s . Golden Meadow. March 1. Carlyss Mardi Gras Trail Ride. West Cal Arena, Sulphur. Marc h 1. Krewe of Babylon. La rose. March 1. Le Krewe Du Bon Temps parade. Larose. March 1. World Famous Cajun Extravaganza/Gumbo Cook-Off . Lake Charles Civic Center, Lake Charles. March 1. Zydeco Dance . Lake Charles Civic Center, Lake Charles. March 1. 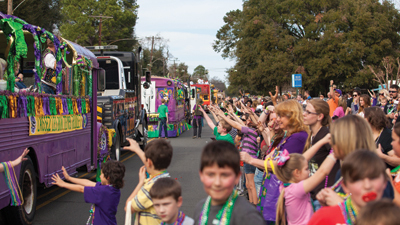 Baldwin Mardi Gras Parade . Baldwin. March 1. Krewe of Cosmos presentation. Sulphur High School, Sulphur. March 1. Krewe of Barkus. Lake Charles Civic Center, Lake Charles. March 1. Krewe of Mardi Gras Parade. James Road, Houma. March 1. Krewe of Illusions. Lake Charles Civic Center, Lake Charles. March 1. Krewe of Omega Parade. Downtown, Lake Charles. March 1. Krewe of Terreanians Tableaux and Ball. Houma-Terrebonne Civic Center. Houma. March 1. Cypremort Point Parade. Cypremort. March 2. Taste de la Louisiane. Lake Charles Civic Center, Lake Charles. March 2. Krewe of Cleophas parade. Thibodaux. March 2. Krewe of Chronos parade. Thibodaux. March 2. Krewe of Nereids. Golden Meadow. March 2. Children’s Day. Lake Charles Civic Center, Lake Charles. March 2. Krewe of Galatea. Morgan City. March 2. Krewe of Terreanians. Westside Route, Houma. March 2. Montegut-Children’s Parade. Montegut. March 2. Children’s Parade. Downtown, Lake Charles. March 2. Lighted Boat Parade. Lake Charles. March 3. Krewe of Cleopatra. Westside route, Houma. March 3. Royal Gala. Lake Charles Civic Center, Lake Charles. March 3. Krewe of Houmas Tableau and Ball. Houma-Terrebonne Civic Center, Houma. March 3. Krewe of Amani. Patterson. March 4. Krewe of Houmas. Westside route, Houma. March 4. Tee Mamou-Iota Mardi Gras Folklife Festival. Downtown, Iota. March 4. Krewe of Ghana .Thibodaux. March 4. Krewe of Gheens . Gheens. March 4. Grand Marais Mardi Gras parade . Hwy. 90 E. at College Road, Lafayette. March 4. Family Affair Mardi Gras Parade . Canal & Main Street, Lafayette. March 4. Krewe of Andalusia . Downtown, Lafayette. March 4. Krewe of Neptune . Galliano/Golden Meadow. March 4. Krewe of Coteau Parade . Francis Romero Memorial Park and LA 88, Lafayette. March 4. Krewe o f Kajuns. Westside route. Houma. March 4. Krewe of Bonne Terre Mardi Gras . Montegut. March 4. Iowa C hicken Run . Iowa. March 4. Motor Gras parad e. Downtown-midtown, Lake Charles. March 4. Krewe of Krewes’ Parade. Downtown-midtown, Lake Charles. March 4. Franklin Mardi Gras Parade. Franklin. March 4. Krewe of Hephaestus. Morgan City. Feb. 15. Krewe Bayou Le Roux Ball . Pineville. Feb. 22. Krewe of S’iriser Gala .Pineville. Feb. 22. Krewe Bayou Le Roux Junior Ball . Pineville. Feb. 22. Town of Woodworth Mardi Gras Parade . Langston Road, Woodworth. Feb. 22. Krewe of S ’iriser Gala.Pineville. Feb. 28. Hixson Autoplex Classic Cars & College Cheerleaders Parade. Downtown, Alexandria. March 1. AMGA 17th annual Children’s Parade. Downtown, Alexandria. March 1. Krewe of Dionysus. Natchitoches. March 2. AMGA 20th Annual Krewes Parade. Texas Avenue, Alexandria. Feb. 15. Amedisys Mardi Gras Mambo 10K. Belle of Baton Rouge Atrium, Baton Rouge. Feb. 15. Krewe of Jupiter. Downtown, Baton Rouge. Feb.15. Krewe of Cypress. Plaquemine. Feb. 15. Krewe of Jupiter parade. Downtown Baton Rouge. Feb 16. Mystic Krewe of Mutts. North Boulevard & Fourth St, Baton Rouge. Feb. 16. Mystic Krewe of Mutts Parade. Downtown, Baton Rouge. Feb. 21. Krewe of Artemis Parade. Downtown, Baton Rouge. Feb. 22. Krewe of Mystique . Downtown, Baton Rouge. Feb. 22. Krewe of Orion . Downtown, Baton Rouge. F eb. 22. Krewe of Mystique Parade . Downtown, Baton Rouge. Feb. 22. Krewe of Okean os. Plaquemine. Feb. 22. Krewe of Orion Parade. Downtown, Baton Rouge. Feb. 28. Krewe of Southdowns. Southdowns Neighborhood, Baton Rouge. March 1. Krewe of Spanish Town. Downtown, Baton Rouge. March 1. Krewe of Spanish Town Parade. Downtown, Baton Rouge. March 3. Krewe of Comogo Parade. Hwy.1 Civic Center, Plaquemine. Jan. 6. Phunny Phorty Phellows . Uptown, New Orleans. Feb. 15. Krewe of Bilge. Sl idell. Feb. 15. Krewe du Vieux. French Quarter, New Orleans. Feb. 23. Krewe of Thor . Metairie. Feb. 23. Krewe of Barkus . French Quarter, New Orleans. Feb. 26. Krewe of Ancient Druids . Uptown, New Orleans. Feb. 27. Knights of Babylon . Uptown, New Orleans. Feb. 27. Krewe of Muses . Uptown, New Orleans. Feb. 27. Knights of Chaos . Uptown, New Orleans. Feb. 28. Krewe of Hermes . Uptown, New Orleans. Feb. 28. Krewe d’Etat . Uptown, New Orleans. Feb. 28. Krewe of Selene . Slidell. Feb. 28. Krewe of Centurion s. Metairie. March 4. Krewe of Grela. West Bank.